This post is part 2 of 2 discussing the brewing of lambic and other spontaneously fermented beers (like Biere de Mars). These two posts are based off of the Traité Complet de la Fabrication des Bières written by Georges Lacambre in 1851. In part 1 I gave an introduction into biere de mars and faro production at the time and discussed some general aspects of these beers and their production. Those aspects included the use of wheat husks, the use of high doses of young hops, and criticisms that Lacambre had for brewers, blenders and merchants. In this part 2 I'll discuss the brewing more and will also include some brief modern considerations. Lacambre describes the grist as being roughly equal parts unmalted wheat and malted barley. This is a bit different than the typical modern lambic grist of roughly 30-40% unmalted wheat. This may not seem like a huge difference, but I think anyone who has conducted a turbid mash will tell you that it is not necessarily a simple thing to do. It's certainly doable, and possibly enjoyable, but when compared to single infusion or simple step mashing, turbid mashing is another beast. And adding more unmalted material won't make it any easier. Some modern brewers feel that using 40% unmalted wheat makes a difference in their lambics compared to others using 35% or 30%, and if that is the case then stepping the unmlated wheat up toward 50% would also make a difference. The malt is described as being very pale for the time, and it is atypical under modern malting standards. Many thanks to my friend Mike of Doehnel Floor Malting (see Malt by John Mallett, p. 237) for countless discussions to help me to understand and contextualize modern and historical malting procedures, and all things grain and malt in general. Lacambre describes the barley as having a long slow germination until the roots are 1.5 cm long. Using root length as an indicator of modification is a bit strange. Acrospire length can give a simple, albeit not wholly accurate idea of degree of conversion, but root length is not as clear. From discussions with Mike, the maltster can exert great control on the roots by proper turning and managing parameters like moisture and CO2. And by proper management root growth will reach a point where it will not be clearly tied to degree of modification. The degree of root growth Lacambre mentions for Lambic malt is longer than for other beers described in this same text. In addition, the malt drying and kilning was done slowly, which would allow conversion of the grain to continue through the kilning process. This is a major difference from modern procedures where pale malts can be dried and kilned quickly, preventing conversion throughout the drying process. So to summarize the lambic malt, they likely had a higher degree of modification from the long slow germination, longer root growth, and slow kilning. And this would improve enzymatic potential, but at the expense of extract. This is a likely culprit, in addition to grain varieties, in the low 'efficiency' mentioned in below. There is a bit of duplicate information regarding brewing, sometimes slightly self-contradictory (not in important ways), in this text. So here I'll try to synthesize it and give ranges covering specifics given at different points of the text. The mighty Senne river as it flows through Lot. 760-860 g/HL young hops for lambic (these hops are noted as being 'good' hops from Aalst or Poperinge - the two main hop growing regions of Belgium), 400-500 g/HL hops for Biere de Mars (Still from Aalst or Poperinge, but no longer described as 'good' or 'young'). As discussed in part 1, the hopping rate for lambic is roughly double modern rates, and the use of 'young' hops is interesting. 3 bags of wheat husks - the use of these husks is discussed more in post 1. This produces 15*230 L wine barrels (34.5 HL or 29.4 bbl) of lambic at an OG of ~1.053-1.054 (~13.2° P) and 15*230 L wine barrels of Biere de Mars at an OG ~1.020 (~5° P). As I mention in this post about visits to Gueuzerie Tilquin - I don't know the specifics of the Boon Meerts OG but based on the information I do have I am guessing it to be 6-7° plato (1.024-1.028). This puts the Boon version as slightly stronger than what Lacambre cites, but not too far off. Lacambre's lambic original gravities match well with modern day 12.5-13.5° P (1.050-1.055) values. The 'efficiency' here is quite poor. I put efficiency in quotes because I really don't know what the efficiency is since I don't know the extract potential of the grains, and that is a pretty big uncertainty. I expect the actual efficiency to have been much higher, but based on modern standards for grain the extract from a lambic brew is quite low. This is likely mostly due to the extract of the grain (both because the grain at the time may had lower potential extract to begin with and because potential extract was used up in letting the malt germinate longer) and therefore would reflect extract differences rather than poor efficiency. Some of the difference may also come from overloading the mash tun and possibly not hitting mash temperatures especially well (Lacambre notes in the text that at the time thermometers were not used very frequently), though lots of sparging might help to counteract an overloaded mash tun a bit. But whatever the case, using modern extract expectations from the grain this is somewhere around 65% total efficiency. Again, the use of modern conditions is unrealistic so to really get a good idea of efficiency I'd have to know the mid-1800s extract of the grain. Also, I don't have a good idea what the efficiency is like at modern lambic breweries, so that's something I should follow up on to see how this compares. I won't get into too much detail here about the mashing for a couple reasons. First - as I said above Lacambre laments the insufficient use of thermometers in his text, and temperatures are not necessarily given for all the steps and instead the volume of boiling liquid are given. Second, I am insufficiently confident that I fully understand what is going on. This is probably mostly due to my poor knowledge of French, but is not aided by unexpected processes and specific terminology. Finally the mash schedule appears to be roughly in line with modern turbid mashing. If, as my understanding of French improves and I discuss the mashing more with others, I find that there are some bigger differences then I will make an update regarding that newly found info. There is no info on evaporative loss but something in this range (probably toward the upper side, if not above it) seems reasonable for a 12-15 hour boil. At Cantillon they boil off roughly 25% of the total volume with a roughly 4 hour boil in two kettles, so something like 10-15% per kettle per 4 hours, which extrapolating to 12-15 hours gives us a range of about 30% to 60% evaporative loss. If that carries to 1800s Biere de Mars, that means that the pre-boil OG was super low! Not much more than water, and even possibly below the FG of lambic of the time (as we'll see below). The OG puts Biere de Mars at the strength range and general brewing parameters of something like a table beer. Pierre Tilquin is quoted in this ratebeer thread as saying that Biere de Mars could be consumed younger than other lambics, and that it would at times be consumed as a working person's beer in the fields (again a similarity with saison), fitting with the idea of a table beer. Biere de Mars also received the spent hops from lambic when lambic was done boiling. After boiling, both were sent to the coolship for cooling. I don't see any mention of two coolships and this presents and interesting challenge. Making the assumption of only one coolship, then the lambic must be removed from the coolship before the Biere de Mars is sent in. In this case the Biere de Mars boil might be on the longer end to give sufficient time for the lambic to cool and be transferred out. But there might be two coolships. Either way, with the Biere de Mars boil length, it would be sent to the coolship in the morning rather than the evening. This means that it would almost certainly cool more slowly than lambic, which could influence inoculation and the growth of inoculating organisms (longer time spent at warmer temps would favor microbes preferring warmer temps). It seems that the idea of a dual kettle brewery was more common historically. This could be due to the desire to make table beers simultaneously with other brews. 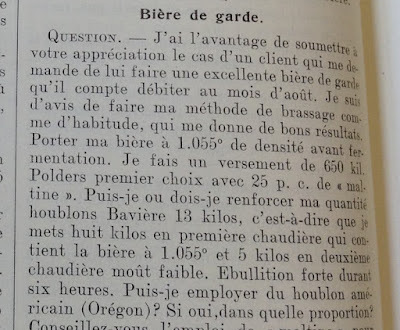 Use of two kettles is reported as normal in French breweries around 1900 (in an Evans text from 1905) and this can still be seen at some Belgian breweries (such as Brasserie a Vapeur, though the second kettle is rarely, if ever, used now). Modern breweries almost never have the necessary equipment to conduct two simultaneous boils, but lambic production seems especially well suited to making 'small beers' or beers from later runnings because a second kettle is needed for heating the turbid portion during the mashing. Once the mashing is done then this turbid kettle (which Lacambre says is referred to by the Dutch name slym-ketel, (slime-kettle) due to the nature of the turbid runnings) is no longer needed. And there is an empty kettle around to receive additional mash runnings. Cantillon follows this sort of dual boil procedure partially in that they conduct two boils of unequal gravity; however both wort streams boil for roughly the same length of time and the kettles are blended into the coolship, or when the coolship is full, in a mixing tank before barrels. I think this historic use of two kettles to produce a small and normal beer (which seems to have been pretty widespread and is definitely not unique to lambic or Belgium) is something that would be interesting to pursue with long aged sour beers. In general this idea is not new to me and I've been drawn away from making second/final runnings beers because I've felt that the malt character wasn't as good as earlier runnings. And with low gravity beers it is already tricky to get good malt character. But I was thinking this from the point of view of cleaner beers, and some beers work fine with more graininess and tannin. This may be more true in longer aged beers like lambics or other mixed-fermentation beers that have an especially expressive fermentation side. This sort of procedure might also be worth trying on small/table strength saisons. So this is something I'd like to try a bit more of to actually compare if I find the final runnings beers inferior to single brews of low OG beers (as I had assumed they would be based on the runnings). And it doesn't have to be as extreme as full separation of early and later runnings or such as low gravity as Biere de Mars here, but blending the runnings streams in proportions to get the general gravities I'm looking for (and possibly diluting with water in the kettle if it seems that water tastes better than the final runnings) is something that I'm feeling I should look into further. Fermentation takes place in barrels and may start as early as days, or as late as more than one month after brew day (basically the same as modern production) and lasts generally ~8-10 months but maybe up to around a year and a half. The bungs were kept open throughout the first summer. From the modern research as well as simple tasting we know that lambic development continues through the second year so I suspect that 'fermentation' here means the more visibly active fermentation. If this is the case, the longer end of the spectrum seems like an especially long time for an active fermentation, so perhaps I am wrong. I might need to look into other sources to find typical aging times for lambic. In discussions with others interested in lambic history I've heard that lambic aging was historically comparable to modern practices, with the possibility of some lambic aged longer than is typical now. So for now, I'm inclined to believe that what is termed 'fermentation' does not include additional aging and development before it is consumed (again, meaning that sometimes fermentation extended especially long). The lambic final gravity is given at 1.013-1.020 (3.3-5.0° P) This seems like quite a high finishing gravity. Some producers today have lambic finishing gravities not too far from this range (Cantillon has been reported to come in at ~1.010 (see this Talk Beer thread)). In the case of Cantillon this makes sense given their OG of roughly 12.5 P/1.050 and their listing of 5% abv. Perhaps the FG listed by Lacambre is the gravity after the main active fermentation. But by the way the FG appears in the text it seems that this is the final gravity when the beer is done and not just an intermittent gravity between active fermentation and prolonged development/slow fermentation. This gets into the uncertainty above for what 'fermentation' means here, and how long the beers were aged. I'll look into this more. I'll plan to do a trial brew or two inspired by 1800s lambic and Biere de Mars when I return to brewing from work in Germany. I'll definitely be making some changes though. I'll shorten the boil to something probably at 6 hours or less (this would also mean increasing the pre-boil OG, which is OK by me as I am already worried about too much final runnings character). As I mentioned in post 1, I think the use of wheat husks, or similar dried plant material, could be a cool addition to a beer like this. And I am probably going to try that out either in conjunction with brewing 2 different OGs from one mash, or more likely at first as a separate trial. I'll probably change a few other things like lowering hopping rate a bit from those quoted here for both lambic-inspired beer and biere de mars-inspired beer. And also I probably won't use the spent hops from the higher OG wort in the lower OG wort. Though I am interested in seeing how higher hopping rates influence the development of spontaneous and mixed-fermentation inoculated beers. I talked a bit more about hops in post 1, but the use of hops specifically noted as 'young' in lambic is intriguing. I think trying out fresher low alpha hops could yield some really interesting results, and modern brews using fresher hops show that there is good potential in this sort of brewing. I'll probably also keep the Biere de Mars-inspired wort as a non-spontaneous brew for now until I have a good idea how my spontaneous trials in progress are doing. I'd rather test out just how the lower OG later runnings wort is without the complicating factor of my local microbial population. Ok, that's it for now, but hopefully in the future I can continue to look into other sources for historical info into lambic, bière de mars, and other interesting Belgian beers. See the History label to follow along with those posts as they come. Barrels at Oud Beersel, some of which date back to the 1800s.